Welcome to Pick City, North Dakota! 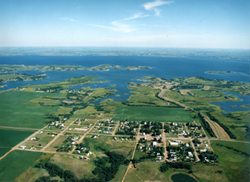 We are a small, friendly community close to the shores of beautiful Lake Sakakawea and in the "heart" of the best fishing in North Dakota. Even with a population of just over 200, we have a lot to offer. Browse our site and see for yourself how this small town put itself on the map! Click on the picture below to get an ariel view of our town!